Structural Solar LLC is a design-build company who specializes in manufacturing highly durable and cost efficient structures for solar installations. The company designs, fabricates, coats and installs foundations and “module-ready” solar structures, most notably solar canopies or solar carports in parking lots. 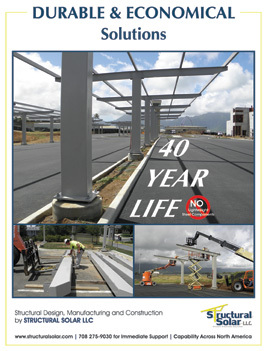 Structural Solar LLC is a leader in the design of Solar Canopies and Carports. Its design intent is clear; manufacture solar carports that are durable, functional, attractive and economical. Durable Design: Structural Solar LLC design solar canopies that are low or no maintenance for 25 years and have a virtually unlimited design life. According to the company’s president Robert Pegnato, it makes sense to design solar canopies that are corrosion resistant for at least as long as the solar panels are warranted. Structural Solar LLC supplies solar canopies that are either hot dipped galvanized or coated with an industrial-marine grade paint system. In both cases, corrosion resistance as measured by ASTM B117 (accelerated corrosion test) are vastly superior to conventionally applied paint systems. Functional Design: Structural Solar LLC designs solar canopies as an alternative to rooftop solar installations. Accordingly, they are designed to a specific width and length and the overall layout is sized specifically to support the intended solar installation. The design also considers lighting, snow plowing and other functional considerations as it relates to solar parking canopies. Attractive Design: Structural Solar LLC believes solar canopies should be as attractive as they are functional. Accordingly, the company offers a number of different design options to solar integrators who are developing university, hospital and other institutional solar projects. Structural Solar has been recognized for award winning design of solar canopies and can provide signed and sealed structural drawings for virtually any solar carport project across North America. Structural Solar LLC designs and builds durable, attractive and economical “module-ready” solar canopies. For more information on how the company can make a difference in your project, visit the resource page of the company’s website.